My post this week is simple. Since I try to concentrate on living out our potential and not letting anything disable us from enjoying life, I was reminded that sometimes we unintentional label people. So my post of the week is "You are a person first, not a diagnosis!" People love Italian and lasagna, and this recipe is so easy and lightened up! My post this week is a look at awkward stages... And how early they can start. Yes, even babies go through awkward stages. 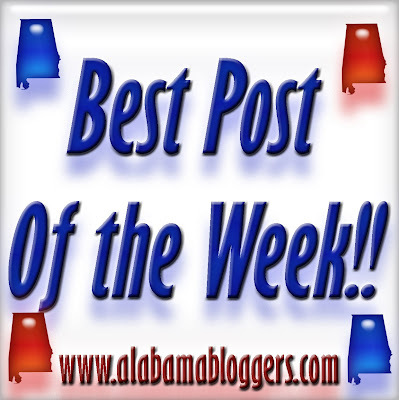 This week, I wrote about Alabama the Beautiful! 6. Wade on Birmingham - I talk about one of my favorite causes, Big Brothers Big Sisters of Greater Birmingham. Find out how easy it is to help out. 9. Magic City Post - Ross Bridge in Hoover was selected as the Best Community in America! A couple of my gal pals and I had craft night using found objects. We made Valentine decorations using pudding molds, lace, jewelry, fabric, etc. Take a look! Not as silly as it sounds. And I'm really proud of the pictures. Very much a non-photographer learning how to use a new, fancy, schmancy camera. This is just a roundup of what's happening in my world of beads and jewelry. This is my first "real" post in a few months. I created a list of Hopes (similar to Resolutions w/out all the pressure) to get myself back into blogging and outline what I *Hope* to accomplish this year. This is also my first time linking up for "Best Post of the Week"! My post is about why I haven't been on line in a week! PC problems! I really wanted to attend this month's meet up, and it would've been my first time. Hopefully I will be able to next month!